Chicago Private Yacht Party- September 23, 2018 Wine Crawl was on the water in a Private Yacht chartered on Lake Michigan. The Crawl included a brunch buffet, open bar, DJ, spectacular views of the Chicago shoreline and for VIP ticket holders a special wine tasting for VIP ticket holders. The group met at Burnham Harbor and partied for three hours like kings! 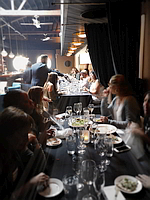 SW Michigan Crawl- May 19, 2018 Wine Crawl from downtown Chicago to Southwest Michigan vineyards and back. The Crawl included a food and wine tasting in the 14 passenger super stretch limousine provided by our transportation partner M&M Limo and an afterparty with complimentary cocktails by Chicago Concrete Cowboy. Dallas Spring Crawl- April 28, 2018, Wine Crawl downtown Dallas. This was a food and wine tasting crawl to three popular Dallas Wine Bar locations including upscale leather seated mini-coach, gift bag, and prize drawings. Chicago Fall Food and Wine Crawl- October 2017 A Food and Wine Crawl with executive transportation visiting three Chicago locations that locals love. Plenty of wine tasting, food tasting, prize drawings, and sommelier teachable moments. Chicago Rooftop and Terraces Crawl- June 2017 visiting 3 popular Chicago rooftops and terraces for a Food and Wine Crawl featuring executive transportation, sommelier teachable moments, live artist drawings, prize drawings and an after-party in the Signature Room at Chicago House of Blues. Chicago Summer Food and Wine Crawl- August 2016 this Wine Crawl started with a kickoff party. VIP stretch limo tickets were offered with more wine in the limo for VIP purchasers in between stops. Attendees were transported by a charted motorcoach to three popular Chicago food and wine locations. Sommelier teachable moments. Prize drawings. This was a very popular large Wine Crawl event. Chicago Rooftop and Terraces Crawl- July 2016. Visiting some of Chicago's most popular rooftop restaurants, bars, and hotels for a wine tasting with sommelier teachable moments and upscale motorcoach for transportation to each of the three stops. VIP tickets offered a stretch limousine with wine in the limo. Chicago Guilty Pleasures Crawl- June 2016 executive transportation to three Chicago locations for Kilwins' Chocolates and ice cream, Love Corkscrew Wine Tasting, Cocktails and mixology lesson, blind food tastings, and other sensory indulgences that pair with wine and spirits. Chicago Winter Wine Crawl- March 8, 2014 Downtown Chicago Wine Crawl visiting three great Chicago Food and Wine locations in executive transportation ending with an after party. VIP ticket holders had more wine between stops in a stretch limousine. This was a warm-up during Chicago winter meeting new friends and old.